On Esp@cenet, thousands of patents are available worldwide, including some 200 Bugatti Patents. Take a look at ep.espacenet.com and search for the Applicant. either Bugatti Ettore, Jean or Roland. A plain search for Bugatti gives other patents as well, mostly from Messier Bugatti. Apart from the central ep.espacenet.com address, also an address per country is available, for instance nl.espacenet.com for the Netherlands. Having just recovered from the car of the century hipe, the Dutch car magazine Autovisie did a enquiry on the best sportscar ever. Various important car-people were asked for their 10 best sportscars, and a list of the best 100 was made. At the IAA in Frankfurt, a new model of the Veyron was shown, showing that it is almost ready for production (scheduled to begin in 2003). The supersportscar is made out of carbon fibre, while the skin is a combination of aluminium and plastic. New is a retractable rear spoiler, and a wheelbase 5 cm longer than before (now 270cm). Apart from performance figures which were given earlier (0-100 in 3s, a top speed of 405 kmh) an accelaration time of 14 seconds was given for the 0 - 300 sprint! The 1922 T29/30 French Grand Prix and 1923 Inidianapolis car fetched 424,000.00 U.S. dollars on the August 19 Christie´s auction at Pebble Beach. 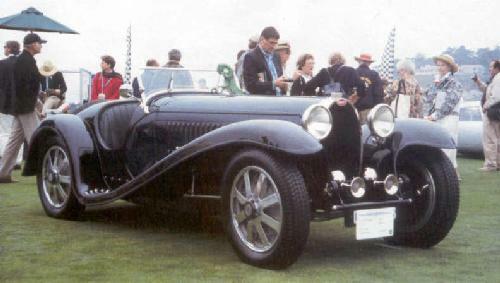 September 3, 2001Bugatti T54 most exciting car of Pebble Beach! Evert Louwman (of the fantastic Dutch Nationaal Automobielmuseum) won the Briggs Cunningham Trophy at this year´s Pebble Beach. This is a special trophy, for the most exciting car in the event! Louwman´s T54 bears a T55-like body. Various news on the Bugatti Veyron, complete press information can be found in the Bugatti revue. The performance of the Bugatti EB16/4 Veyron shall be 405 km/h! 0 - 100 acceleration will be 3 seconds. Of the Veyron 50 will be made per year, 40 have been sold already. These cars will not be made at a new production facility near Molsheim, but at various facilities of Volkswagen. Bugatti Headquarters will remain at the Château St. Jean, though. T57C Cabriolet (no details): Hfl. 1059904, approx. $423.000. It is with great sorrow that we wish to announce the passing away of Mrs. Stella Tayssèdre, former Secretary to Mr. Ettore Bugatti (from 1928 to 1945). Mrs. Stella Tayssèdre died in Paris on April 29, 2001, aged 94. Chapelle du cimetière du Père-Lachaise, Paris 20e. A book of condolences will be open at the service. Ferdinand Piëch has officially announced that the future Bugatti to be presented in 2003, will be the most powerful car in the world with 1001 bhp and also the fastest with a top speed of 406 kmh! It will have 4wd and it will be priced at 6.000.000 FF, that is around 900.000 euros! Although it never flew and is now on display at the EAA Air Adventure Museum in Oshkosh, Wisc., the sleek, futuristic lines of the Bugatti Model 100 racer still inspire speed-seekers. The Indianapolis-based American Aviation Co. is latest to fall under its spell. A spokesman for the company announced recently that it plans to build a modern composite version of the legendary 1937 design. Engineering is already under way and construction of the new Bugatti is scheduled to begin next month. AAC's goal is to build a plane that will break the world piston-powered speed record of 528 mph, set in 1989 by Lyle Shelton in his Grumman F8F Bearcat "Rare Bear." AAC is also eyeing time-to-climb records and a possible assault on the sound barrier. Info from: www.landings.com, brought to my attention by Steve Tournay. 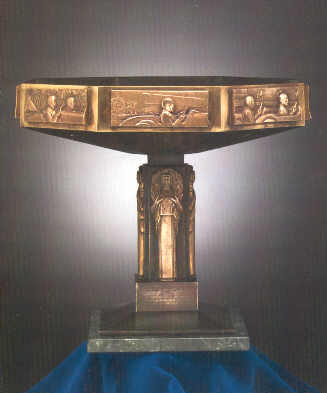 On december 15 the art et l´automobile auction closed in New York, where this beautiful winners trophy for the 1937 edition of the Le Mans 24 hours race was auctioned. As we all know, the trophy was received by J.P. Wimille and R. Benoist, who won that year in a Bugatti T57G. It´s a pity, but it now is too late to obtain this piece of Bugatti history, as it was sold for $31,165. For future auctions go to arteauto.com.